Tomorrow- February 3- is an important day because it is the start of Chinese New Year and the beginning of the Year of the Rabbit. 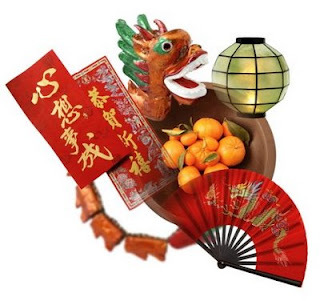 Like Korean and Vietnamese cultures, Chinese New Year begins on the Lunar New Year. Around our home, we’re getting ready for the start of the new year. I’m spending the day cleaning the house to sweep out any bad luck because it’s customary to avoid cleaning for the first week or so of the New Year so you don’t sweep away good luck. Tomorrow Little Miss Techie and Captain Computer will wake up and eagerly say “Gung Hay Fat Choy” (Happy New Year in Chinese) in order to receive the red li see envelopes from each parent and will head off to school wearing something new. How can you celebrate with your family besides ordering Chinese takeout? Print the story of the Chinese Zodiac to share with your family. Since each year is represented by one of 12 animals, use this Chinese Zodiac Sign Calculator to figure out which animals you are. I like the calculator because it takes into account your actual day of birth in figuring out which animal you are. Many calendars like those you see on placemats at Chinese restaurants follow the western calendar that begins on January 1. They don’t take into account that those with January birthdays (like Little Miss Techie) might fall under a different sign since Chinese New Year is determined by the lunar calendar. I also like that this site will give you a link so you can read and print the character traits for your animal sign. Did that make any sense? Make felt fortune cookies, dumplings, or a tray of oranges for your play kitchen. The oranges signify gold and prosperity for the new year while dumpling preparation the night before the start of the new year is a tradition. Make or print li see envelopes to exchange with family members and fill them with lucky money. It is customary for married couples to give them to those who are unmarried. With my brother’s recent wedding, he’s now on the giving end, rather than the receiving end, of the li see! Prepare a Tray of Togetherness. In my grandparents’ and parents’ house a square lacquer box whose different compartments were always filled with sweets like candied sweets of ginger, winter melon, lotus seeds, sliced taro root, crunchy water chestnuts, and coconut at this time of year. Our box may be an octagon plastic one but it’s filled with sweets that my parents sent and the kids and I are exercising restraint to not gobble up all of the winter melon and coconut. Make one at home by gathering 8 dishes and filling them with sweet treats. Eight is a lucky number! Note to my parents: please bring more! Amazon affiliate links contained in this post. Wow. I am all about not cleaning for the next week. Awesome. Jack had an assignment about Chinese New Year in his reading packet, so we talked all about it yesterday. I think they might really enjoy checking out some of these activities. Thanks!! Great ideas here! I wrote a post of my own about celebrating Chinese New Year by trying kite flying with kids as a family project http://www.thebookchook.com/2011/02/lets-celebrate-chinese-new-year.html and am about to go add your link to it. My name is Abby Herbert and I help to run a website offering hundreds of free foundation stage and key stage 1 teaching resources called Early Learning HQ (www.earlylearninghq.org.uk). I hope you find the resources useful, everything is created by me and a small team in Wales and it would be really nice if we could share them with more people. Let me know if there is anything else I can make for you.